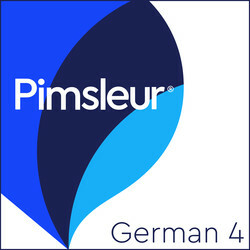 Builds upon skills taught in Pimsleur’s German Levels 1-3. You’ll be speaking and understanding German with near-fluency and with a broad range of conversational skills. In Level 4 the pace and conversation moves more rapidly, accelerating exposure to new vocabulary and structures, and approaching native speed and comprehension. 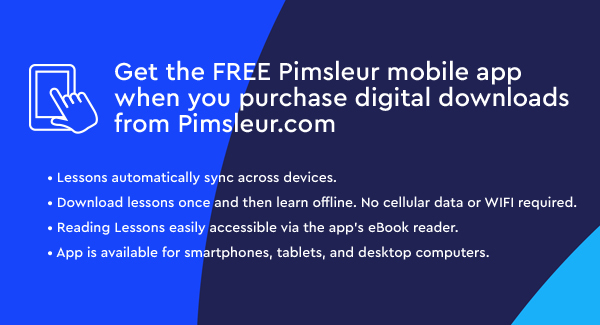 You’ll learn to speak about your professional and personal life, needs, likes and dislikes, and to create complex sentences discussing the past, present, future, conditional, and subjunctive. -Business: attending trade fairs; meeting with colleagues; discussing professions, products, and customers’ concerns; making or asking for suggestions. -Personal: discussing where and when you met someone, divorce, German heritage; using the informal form to address several people; talking about family members including distant cousins and in-laws; losing a personal item; talking about getting a driver’s license, having a broken item repaired. -Traveling and sight-seeing: talking about jet lag, discussing types of train transportation, buying tickets, visiting wineries and wine festivals, seeing restored old cities or buildings, traveling to the coast or mountains, renting an apartment, making restaurant reservations, registering at a hotel, discussing hotel amenities and features such as an elevator, a breakfast buffet, fitness room, non-smoking room, internet access. -Shopping: purchasing items, trying on clothing, describing purchases, colors, sizes; asking for a bag or a receipt; discussing change for a large bill. -Activities: Reading, hiking, watching a show on television or online, taking long walks on the beach, talking about a good film. -Health related: feeling ill (cold, headache, sore throat), discussing allergies, breaking an ankle or wrist; going to an emergency pharmacy or the emergency room of a hospital, and dealing with medical emergencies, saying that someone looks tired or looks good, asking about the health of various family members. Weather: describing humid, hot weather, heat waves, cool, chilly, or rainy weather. -German culture: Reunification, how to broach the subject of speaking informally, restaurant etiquette, having the traditional coffee and cake. After Lesson 30, a short story broken down into 20 manageable segments (over one hour) is provided for practice reading German.